This is yet another story of two sisters who could never find the perfect accessory and hence decided to do it themselves! We love these kind of stories! Founding Dutch sisters Liesbeth and Violet could never find the perfect shawl, always struggling with the shapes that were never really right. 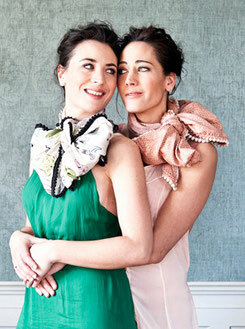 So, back in 2011, they started off on a old sewing machine, making their first POM shawls for family and friends. Soon enough, people were asking for more and so POM Amsterdam, Piece Of Mine was born! Until today, the two sisters design all shawls and patterns themselves in their atelier in the beautiful city of Amsterdam. In the meantime, all POM shawls are made in Europe.